Thank you for visiting our Ft. Worth Dealer's Listing! We can usually have your item shipped to you much quicker than it takes to hunt for a closer dealer if you are outside of the DFW - Fort Worth area, then have to wait for them to update their stock. Please contact the dealer listed to the right. Serving the following areas in and around Fort Worth, Azle, Burleson, North Richland Hills, Hurst, Bedford, Euless, White Settlement, Granbury, Arlington, Mansfield, Haltom City, Lake Worth, Saginaw, Keller, Watauga, Benbrook, Crowley, Southlake, Roanoke, Weatherford, and Mineral Wells. We represent the largest AMSOIL Supply and service, and the top 5 in new accounts in the US. We can meet any need. South end of town - John Ekstrand "Rhinosynthetics"
or 1-800-409-9050. Michael services several accounts throughout the area. Ft. Worth, Hurst & Midcities areas - Product in stock! Brad Osborne - Call: 817-246-4100 They also sell direct but can also change your fluids. AMSOIL's new Absolute Efficiency air filters are 100% efficient at 2 microns. You filter out the harmful dirt while never compromising air flow. Expect airflow to be 3X of common cellulose for 100,000 miles or 4-years. Simply clean with low pressure air or vacuum! Other New Amsoil Locations. You can ask them for any of the products if theyt are not kept in stock. The Ft. Worth, Keller, White Settlement ares are one of the fastest growing AMSOIL Markets due to the close by national warehouse and years of AMSOIL familiarity. Please enquire or call to order and pick up in any quantity. Additionally if I should happen to not have your selection in stock, shipping is sometimes more convenient as it's only one day or less from the Arlington Distribution center. Should you have multiple vehicles or order more than $100 with of product per year, be sure to print and complete the Preferred Customer or Dealer form. This gives you the benefit of ordering direct at the wholesale price while having hard copies of all the materials and our monthly AMSOIL Magazine. AMSOIL will send you the Preferred Customer packet with the total filter and synthetic oil ordering and pricing guide - Everything at the absolute lowest price. We have it all from prize winning compressor oils, diesel engine oils, the best selling motorcycle oils and one of the only gear lube lines which actually meet the specs on the bottle. Be sure to look at our new oil and air filters which use nanotechnology for 100% guaranteed filtration. Please examine the Absolute Efficiency Air Filters or the 100% efficient at 15 micron Ea Oil filters. Remarkably these match the general interval AMSOIL engine oils are famous for which is 25,000 miles. In Albuquerque this saves your engine in higher than average dusty conditions. Is your gasoline engine prone to oil sludging? Does your engine operate at near overheat conditions? You need to use a low volatility synthetic oil. Please consider our ASL 5W30, ATM 10W30 or the top of the line AMSOIL Signature Series 0W30 SSO. These oils will not only keep the oil passages free of sludge but will result in lower operating temperatures due to the nature of the 100% PAO base oils. This is a FACT as other "Synthetic" brands use base oils with more insulating GROUP III stocks which will not have a positive effect on temperature. Many would find it difficult to believe but this system typically allows oil change intervals to exceed 250,000 when using AMSOIL. We have several different kits for all vehicles, both diesel and gasoline. These have a proven track record with passenger cars, light & diesel trucks, school districts, trucking fleets, and marine applications. Remember with AMSOIL you increase mileage even when upgrading from synthetics thought to be of similar quality. For your gasoline vehicle try our 100% full PAO Synthetics with our 25,000 mile filters. You save gas and stop wasting money at other quick lube centers. As you look through this Ft. Worth site please ask for your free AMSOIL catalog before leaving. With AMSOIL in gasoline engines you simply reach 25,000 miles or one year before draining your oil. With gas prices so high in Tarrant County, AMSOIL has the solution. Add up to 9% to your mileage. You can normally reach 25,000 miles or one year before draining your oil. Also contact us for all your 2-cycle, racing motor oils, transmission gear and hydraulic fluids. .
How does your Differential oil rate? 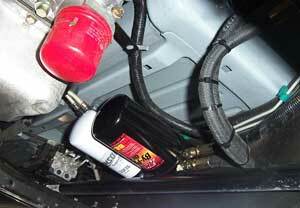 Is my differential oil more important then the motor oil - YES IT IS. Please see the new GEAR OIL Study completed by an independent test lab in San Antonio, TX. Pass on to your friends. Local Hurst - Euless - Bedford demand has created a great need for more AMSOIL dealers in this area, especially in the outlying areas. You get excellent support from myself as I am part of one of the most resourceful AMSOIL dealer groups in the country based right here in the metroplex. We can send local and web generated leads your way. The #1 question we get from local customers is, "Where can I find AMSOIL in Fort Worth or Burleson?." Our distribution center can quickly have your product anywhere whether you need 2-cycle for your dirt bikes or ATV oil, or if you have a weed eater you need to last in the hot & humid climate of the area or more dusty ares of NW Texas. AMSOIL synthetic lubricants keep the go-karts running at Mountasia Family FunCenter in North Richland Hills, Texas, where Dealers Andy and Magdalena Gomez work with mechanic and shop foreman Stan Williams. When Andy and Magdalena Gomez took their two small children to the fun center one day about five years ago, the idea of approaching management to become an AMSOIL commercial account was born. The couple investigated the unique challenges of the operations, especially with the go-karts, and they provided solutions with AMSOIL products while registering a new commercial account. The fun center has a miniature golf course, game room, batting cages and go-karts. Because the go-kart engines are similar in size and power to the engine in a pressure washer, Williams uses AMSOIL Formula 4-Stroke® Synthetic Small Engine Oil (ASE) in them. (For racing go-kart applications, Briggs & Stratton® Synthetic 4T Racing Oil [GBS2960] is recommended for maximum protection and performance.) He previously used conventional oils and other synthetic brands. The 31 go-karts take a beating in the Texas heat and often run for 12 hours a day. Williams found that AMSOIL Formula 4-Stroke runs cooler, while holding up a lot better and longer in the long, hot days of summer. “After installing Formula 4-Stroke there were no more burned-out clutches — not one,” Williams said. Williams also uses AMSOIL Quickshot® and Power Foam® to keep the carburetors and other engine components clean and trouble-free. He recently started using AMSOIL Signature Series Synthetic Automatic Transmission Fluid (ATF) in certain hydraulic applications such as the Frog Hopper kiddie ride. With less downtime and maintenance requirements, Williams is better able to manage his time at a very busy family fun park. Truckers of all stripes continue seeking ways to reduce costs, but keeping a truck on the road is never cheap. While passenger cars have seen improvements in fuel economy through better aerodynamics and the use of lighter materials, logging trucks and other transporters rely on the loads they haul. Lighter loads don’t add up to savings. That’s why local fleets and owner/operators need to know the fuel economy benefits that AMSOIL synthetic motor oils and drivetrain fluids provide. Whether within city limits or riding the highway, truckers can experience significant savings, and we have the studies to prove it. Highlights the test results detailed in the Diesel Fleet Fuel Economy Study (G2904) and Diesel Fleet Fuel Economy Study in Stop-and-Go City Driving Conditions (G3086). Looking for our Dallas Dealer ?